Barry and I are huge fans of Cincinnati style chili. It’s GOOD stuff, man. It’s not your typical chili…it’s got a different taste to it – and you eat it with NOODLES. Being such a big proponent of all things noodle, I was destined to love this dish. Noodles and me, we’re tight. Don’t be thrown off by the cinnamon in this dish…it’s special. I like special food. That’s because I’m special. Yep – I said it. I bought a Cincinnati cookbook when I was visiting my relatives up there (Hi Amy and Ben!) just so I could have a genuine Cincinnati chili recipe. There are different ways and styles with it – if you eat at Skyline Chili, you’ll notice a different flavor than if you eat at Gold Star Chili. Barry and I prefer Skyline. I adapted the recipe in the cookbook to be made in the crock pot…it’s also adapted just a bit based on what I have on hand at the house. Oh yeah – and I used venison instead of beef…cause that’s how I roll. Booya. Annie has this thing with stirring…if I am stirring in the kitchen and she’s somewhere else, she can hear it…and she comes running. It’s a sixth sense with her. Anyway, I let her help me stir this before cooking it. She did well…and then I laid down the camera and she sloshed some over the side. 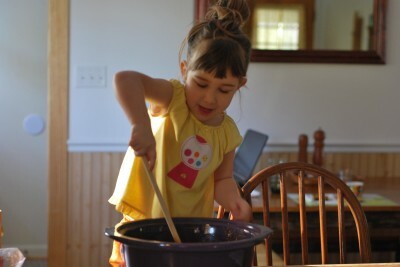 She’s a rambunctious stirrer like her Mama. You can use whatever type of noodles you want to use. 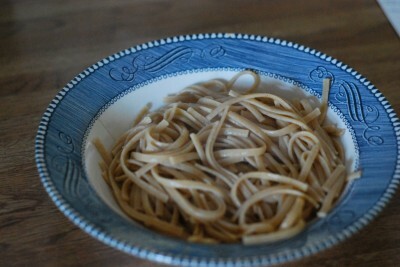 I used whole wheat linguine…because I like flat noodles. I’m weird like that. I like angel hair pasta too – but I didn’t have any. Sad. Actually, I like all pasta, who am I kidding? If it’s pasta, I’ll eat it. Amen. 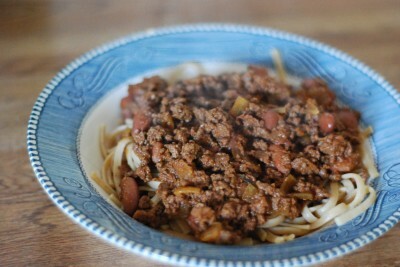 When your chili is done, boil the noodles – you want them to be nice and hot when you slop that chili on them. Oooooooh baby! Now, here’s the thing. Cincinnati Chili can be served 5 ways. This dish is considered 5 Way Chili because that’s how we roll. I just threw the beans and onions in the crock with the meat to cook. The cheese and pasta come later. Start off by putting your noodles in the bottom of a bowl. Add your chili on top…look at that beautiful steam! Put cheese on the top of that and you have 5 Way Chili! If one of the ways doesn’t float your boat, just leave them out. But really…5 Way is the best. I know what I’m talking about. It’s beautiful man. Just beautiful. NOTE: This might not be the best dish for you to eat if you’re nursing an already gassy baby. Ahem. *Cough* BUT, it just might be worth it….. 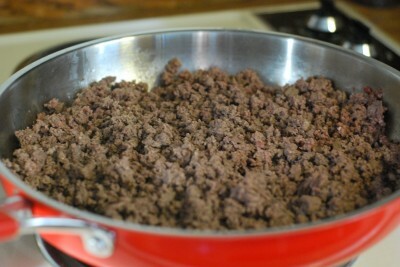 In a skillet, brown the ground meat. Pour into 5 quart crock. Stir in onion, garlic powder, tomato sauce, water, Worcestershire, vinegar, salt, pepper, chili powder, cinnamon, and allspice. 1 hour before done, add kidney beans. 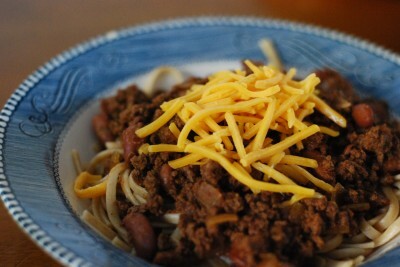 Layer noodles in bowl, add chili, and top with cheese. Bet I could work out many of these recipes for my thermal cooker! My husband is from Cincinnati and loves Skyline! I made this for him for his birthday. He said it wasn’t quite the same but still very good! Thanks for posting. Thanks Felicia. Hard to beat the original, but I’m glad he liked it! I just made this. I cut the recipe in half since I’m the only one in the house that eats chili. I realized after I started adding the ingredients to the 1 pound ground beef that I forget to half the recipe so the onion, garlic powder and Worcestershire sauce amounts were for the 2 pound recipe. I also added 1/2 tablespoon of unsweetened cocoa powder. OMG it was so good. Next time I make it i’m going to keep those 3 ingredients amounts the same. I will be making this often. Thank you for the recipe. I’m glad you liked it! And thanks for the ingredient tip! I made a batch of this for a church dinner, and my husband and two of his friends ate over half of it! So I made another batch to take tonight. It’s a hit! Thank you for the recipe! I’m a Cincinnati girl and love skyline! With a bunch of little ones and trying to eat a little more healthy, we don’t eat out much at all. I’ve tried different recipes before, but honestly I’m not crazy about the chocolate either. Going to give this a try! Do you drain the meat before adding to crock pot? If it’s a fatty meat, you sure can. When I use venison, I don’t because it doesn’t seem to need it. We visited Cincinnati 5 years ago and ate a Skyline. Since we’re from the south and have our own style of chili, we had been “warned” about this cinnamon-studded concoction and how yucky it was. We took that as a challenge. WOW! We love this stuff! I couldn’t find a recipe fast enough. In fact, I was googling in the van on the trip back home. The recipe I landed on includes cloves too and…even unsweetened chocolate! Hubby and I loved the 5 Way, and we also had the option of sprinkling oyster crackers on top – which we did. The kids chose to order theirs over skinny french fries – an option offered at the restaurant – which I thought was odd, but they adored it and I still buy a bag each time I make this dish, just for them. I hope you enjoy my version, Karen! It also freezes very well. 🙂 Just an FYI. My mom worked at skyline chili and she knew how to cook. Her recipe calls for unsweetened bakers chocolate along with the cinnamon. The other spices you have are pretty close. 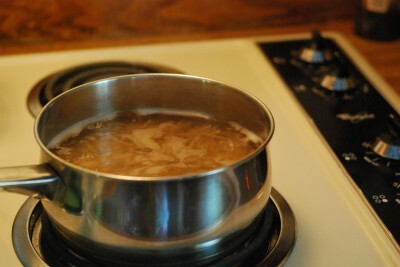 Although in my moms recipe the meet is not browned, before adding it to the liquid, it is boiled along with the rest of the ingredients. I’ve never seen Cincinnati chili done in a crock pot before, I’m willing to give it a try ?? I have used the chocolate in there, but we actually prefer it without…so that’s why it’s not listed. 🙂 Looooooooooooove Skyline! My husband is a big Gold Star Chili fan and we just started clean eating (I actually prefer to call it cleanER eating–we are doing 80/20). Anyway, we tried this last night and it was a hit! We used the original amount of 4 tbsp chili powder. I started with the smaller amount, but it was nowhere near enough to get that authentic Cincinnati chili taste. My super picky eater of a husband thanks you for one more recipe to add to our clean eating rotation! And all 4 of our kids liked it too! I love lentils! What a GREAT idea! Cincinnati Chili not all natural it has Worcestershire sauce which has MSG in it. Not the one in my fridge. But feel free to move along to another recipe that is more fitting to your tastes. 🙂 I’ve seen bunches of options on Pinterest. This is my version of it. 😉 Been to Cinci many times and I really like it there. But of all the chilies we had there, we like this the best. Thanks DP, I’ve seen so many recipes for Cincinnati Chili, I often see the meat browned. The meat must be boiled. Add more water to the crock pot, crumble the raw meat in followed by all the other ingredients. I grew up in Delhi. One more thing….I did about 4 or so TEASPOONS of chili powder. This tastes so much like the “real thing” that it’s CRAZY!! I didn’t have Worcestershire so I used soy sauce with brown sugar…..OMG!!!!! C R A Z Y good!! I’m just tickled pink to hear that! It’s not hard to boil the hamburger if you just put all of the ingredients in all at the same time and stir and cook. I use that pampered tool to break it up a bit. Boiling the meat gives it the fine texture like skyline. (Grosses my sister out to put in the raw meat) I guess I should make it from scratch inside of buying the Cincinnati Chili pre packaged mix if I was Concerned about being authentic.? Good point! And yes, I would imagine there is a more “authentic” way to make most everything. But sometimes close enough is good for me 🙂 Thanks for commenting! We LOVE skyline chili. When we are close we will go out of our way to find a Skyline!! Thank you for the recipe!!! I’ve made this twice now. As written and then changed a bit for our tastes and both times it was consistently good. No, it’s no Skyline. However, it is the best recipe I’ve found. We’ve now changed it to make it a healthier option by substituting ground turkey for the beef and wheat noodles for the pasta. We keep the 4tbsp of chili powder because we like the kick. I found it to be delicious and I am so glad you shared it. Prior to finding this recipe I was on the verge of giving up finding a recipe I could make no matter where in the world we live. Now I have one. Thank you so very much!! I just made this recipe and it is inedible as written. The dog wouldn’t even eat it, and he eats poop when given the chance. There has to be a mistake – I think it should be 4 teaspoons of chili powder, not 4 tablespoons. Sorry you didn’t enjoy the recipe. We (and others, based on the comments) are fine with the 4 tbsp of chili powder, but I changed it to reflect your feedback. If you try it again with the lesser quantity, let us know how it turns out! I don’t like to cook so made this recipe because my husband likes to eat. It really didn’t go over well. Apparently my family doesn’t believe in cinnamon in chili. Never brown the meat, put it in the water, spice and liquid mixture and break up with your hands. That is how you get the fine texture of real Cincinnati chili! Yum! when making Cincinnati chili, the meat is never browned. it’s boiled. major fail! A 4 way can be with beans or with onion! Just had a 4 way bean at Skyline last night! A 5 way is with both beans and onion! Just sayin’!! Next time you’re in cinci, hop across the river & try Dixie Chili! It blows gold star & skyline out of the water. I didn’t believe it til my native KY hubby took me 😉 any of the little local chili places are SO good! Growing up in Cincinnati I have eaten this my while life, but your missing one ingredient…..cocoa!!! And a four way is either kidney beans or onions…. Great idea! I love making chili (and we’re in Cincinnati and love our Cinci chili), but haven’t thought about making it in a crock pot. We also like ours with a dollop of minced garlic under the cheese. When I make it for my kids (and how mom made it for us when we were kids), we do an immersion blender on the beans — THEY DON’T KNOW THEY ARE THERE AND SO THEY EAT THEM, hahahahahahaha, we’re so tricksey like that. I have a dear friend that used to blend raisins in her food processor for that yummy cinnamon filling inside her home-made cinnamon rolls! Her kids hated raisins but would scarf up those rolls…they never knew! She did the same thing with vegetables in spaghetti sauce! I like the beans and so does my son but my husband and daughters say they don’t. My solution was to put 1/2 to a 1/3 of the can in a dish with some of the spicy sauce to cook in the microwave or a small saucepan to cook on the stove. The rest of the beans I put in the food processor with a spoonful of the can liquid or water and made the beans into paste which I added to the pot. I used this method to make a Hamburger Helper chili recipe when we camped. One time I forgot to pack the beans and they all complained it didn’t taste as good as when I made it before! (I blamed the water! LOL) Moms just have to be tricksey sometimes! I’m making this now and didn’t read the directions very well at first! I was going to cook it while I was gone so the kidney beans will be added very late. If I add them earlier, would they taste bad, or lose texture? If I added them before I leave, they will be in for 5 hours. Thanks for any info! I’m a Cincinnati girl and I’m excited to taste this! It won’t hurt. They might get a tad soft, but it will still taste yummy! 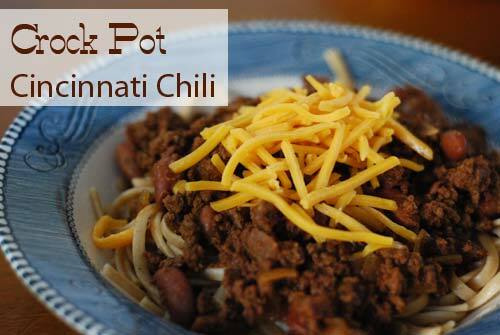 Ooo, I hadn’t thought to make Cincinnati chili in a crock pot… why didn’t I think of that? That’s why you’re writing the blog and not me! THANK YOU. Your recipe is different than mine. Mine includes unsweetened cocoa powder, and a bit of cumin and cayenne pepper (some like it hot, altho I back off the cayenne quite often!). Here’s the link if you’d like to try it: http://whatscookingamerica.net/Beef/CincinnatiChili.htm ENJOY! I made this for dinner last night. It was tasty, but I missed the oyster crackers and spicy sauce from Skyline. Since there’s plenty left over, I’ll be scouting out the crackers tonight. Any chance you know how to make their spicy squeeze bottle sauce? My local Skyline sells their hot sauce and oyster crackers. I have the hot sauce from them in my fridge now. I’m going to try this recipe soon. I live in Oklahoma and we’ve always referred to these as 3 ways. Chili, beans and spaghetti. Yum! Serve with a generous topping of shredded cheddar cheese. Oh yes – NEED the cheese. 🙂 I hope you enjoy every bite! Oh man, you are SO right about Cincinatti Chili being the best chili every! It’s the only kind of chili we make at our house! Love it! But, I’m super excited to try this because my recipe has Brooks Chili Hot Beans in it – and have you looked at the ingredients on those?! Not good! So I’d love to make it without using the canned chili beans, and in the crockpot – even better! The chili looks great-but it looks beautiful in your blue Currier and Ives dish. I have the same set handed down to me by an aunt and have since collected several serving pieces. Country cooking and collecting antique country dishes are both passions for me. We live on a farm here in central VA and my husband keeps us in venison can t wait to try this recipe. Success! I did add some cocoa. And skipped the beans. He said ”yup, that’s it”. I had mine five way, it was delicious and I’m stuffed! WOW!!!!! 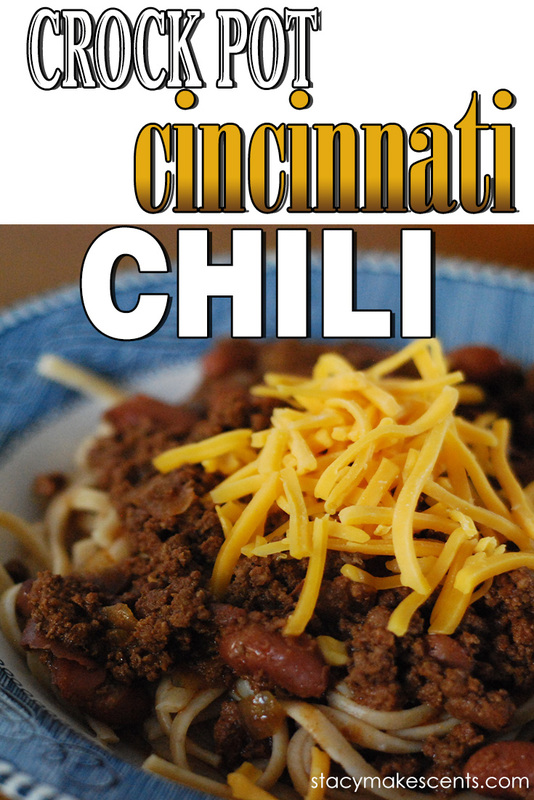 An actual homemade recipe for Cincinnati Chili! We used to have this when I was a kid, but we would have to get the packet of seasonings whenever we went to Cincinnati. Thanks! Thanks, Stacy! I was in a dinner funk this week, didn’t follow my menu because nothing sounded good. You know what I mean about those menus?? Since I didn’t follow my plans, this is what I’m cooking tonight, and it DOES sound good! I hope you like it! Now I’m nervous….. I made it last night…really tasty! I cut the chili powder down to 2T. Had to serve it with asian rice stick noodles because it was the last gluten-free pasta alternative in the pantry. Not a bad combination. The recipe’s a keeper, the fam liked it! I’ve never had rice stick noodles…but now I’m intrigued! I’m in Texas now, and you would think I was feeding them poison…LOL..
I’ve added the cocoa powder too, but we prefer it without. 🙂 We’re weird like that. Thanks for all the great recipes!! I’m from Cincinnati and have made this chili quite a bit and am always excited to see it get out into the world! Your recipe is very similar to mine though the quantities vary a little. Mine also calls for 1 t. cumin (which I always add b/c it’s the best spice in the world), 1/4 t. clove, 1/2 t. cayenne, and a bay leaf. I’ve never added cocoa powder, so don’t know how it compares, but do always add a half ounce of bittersweet baking chocolate to my chili, which def adds authenticity (I’m a Skyline girl, myself, but you should also check out Price Hill Chili when you’re in town next time – they are the original). I think I’m going to make this tomorrow. Thanks for the inspiration! We’ve tried the cocoa in there…but I wasn’t really a fan, so that’s why I left it out. I didn’t see Price Hill when I was there! I’ll keep an eye out. 🙂 Thanks! I was just browning some venison when I read this-really! It’s cooking now and I’m going to trust you on the cinnamon /allspice thing. Thanks! Oh mercy…now I’m REALLY nervous. If you hate it, don’t hate me. Haha! That’s only because he thought they were supposed to be brownies though! And I LOVED it 🙂 Trust me, he’ll like this. :-/ <---- that's my skeptical face. What is the non-crockpot version? Oh I love chili on angel hair. Too bad we’ve yet to find a Gluten free angel hair 🙁 I need to go back to looking for some! Stacy, you seriously rock 🙂 Now that I see the one brand I think they carry that brand at our sprouts, and we’re going there this weekend, so I’ll see fi they have the angel hair. The thing with gluten free is that you need to try it once before stocking up because it might not taste good! Technically, it’s what my husband has to eat 🙂 I’m glad he’s just intolerant to gluten and not celiac because I can still keep regular flours and pasta on hand for our toddler- helps stretch the budget a bit since we’re not buying enough gluten free for all of us! And our son doesn’t like the gluten free pasta anyways! Fortunately for us, our local store, HEB carries it’s own brand of gluten free pastas, which is what we’ve been using and it’s only $2 for 12 ounces- compared to the others we’ve seen, that’s not a bad price at all. BUT there are only 3 choices- regular spaghetti, spirals and a twisty type pasta. It’s a corn and rice blend and tastes very similar to regular pasta- except it tastes horrible warmed up! And don’t even think about making a pasta salad ahead of time with it- yuck! So, only make as much as I need at once? I bought 16 ounces which is WAY too much for just the three of us. I haven’t tried that kind before, so the first time around, maybe make a little extra to see if that kind is good leftover, but don’t expect it to taste as well when you try warming it up (have a backup for lunch, if you know what I mean!). It MIGHT taste fine the second time around but certainly don’t make it all the first time! Then you’ll know in future if it warms well. The brand we buy doesn’t, but we only tried one other brand before settling on our brand. Let me know how it goes! Don’t you agree that Skyline beats out Red Star?? Have you tried Blue Ash Chili? Another Cincy favorite, featured on Diners, Drive-ins and Dives. They have a Mexican lasagna that is layers of chili, tortillas, and Pounds of cheese!! No, I haven’t! Next time we go, I’ll have to check them out! Gotta keep the hubs happy! Oh no!!!!!!!!!!! You’re making my food for the in-laws?! AHHHHHHHHHHHHHH!!! I can’t take that pressure – I really can’t. Now this looks great! I will try it. I love pasta too.